In this issue of the newsletter, we're going to explore skin anatomy. It's far more interesting than you might think. But beyond interesting, it's important. We need to understand skin anatomy so we can talk about skin health, skin physiology, and all of the things that go wrong with your skin--including aging. Make no mistake: your skin is more than just a shrink wrap designed to cover your body. It is your largest organ (like your heart, liver, and spleen), weighing in at around six pounds. Stretched out, it averages about 20 square feet. It is a major organ of transportation in your body. It moves waste such as sweat and carbon dioxide out of your body. And it moves vital nutrients such as oxygen into your body. It is vital to remember, that as an organ of transportation, it can just as easily carry harmful substances (pesticides, petroleum based estrogens, etc.) into your body, as it can beneficial substances--if you are not careful. It is your first line of defense in protecting your internal organs from both trauma and invaders. And, as the most visible organ in your body, it serves as a canary in the coal mine, constantly indicating the state of your overall health. If your skin is prematurely dried up, wrinkled, gray, and generally unhealthy in appearance, it is a strong indicator that all of the other organs in your body (heart, liver, kidneys, etc.) are seriously compromised as well. At your next dinner party you can amuse and delight your guests with these additional tidbits about skin. By the age of 70, each of us has shed about 40 pounds of dead skin. And if that doesn't impress them, maybe this will. Of all the dust you see floating around in the average house, 75% of it is composed of dead skin cells. Or how about, in one square inch of skin there are 625 sweat glands and 90 oil glands. There are also 19 million cells, 19 feet of blood vessels, 19,000 sensory cells, 65 hairs, and, best of all, 20 million microscopic animals such as mites…in each square inch. Your skin is generally between 1.5-2 millimeters thick. It contains a rich field of blood and lymphatic vessels can carry any toxic substance that penetrates its outer layers quickly throughout the body. The color, thickness and texture of skin vary over the body. There are two general types of skin; thin and hairy, which is more prevalent on the body, and thick and hairless, which is found on parts of the body that are used heavily and endure a large amount of friction, like the palms of the hands or the soles of the feet. Officially, your skin is composed of two basic layers: the epidermis and the dermis, plus a third underlying layer consisting of mostly fat cells known as the subcutis. But there's also a surface layer known as the microbiome that you will not find listed in any current anatomy texts and that is turning out to be far more dynamic and far more important than anyone ever imagined. The top/external layer as listed in anatomy books is called the epidermis. It consists of tightly-packed dead skin cells and is roughly about the thickness of tissue paper, except on the soles of the feet and palms of the hands where it is generally much thicker. So many dead cells are constantly being lost from this layer that it is totally replaced about every five weeks. The primary role of the epidermis is to protect the body from the environment. Before any substance can enter the body, it must first pass through the tough outer layer of the epidermis. 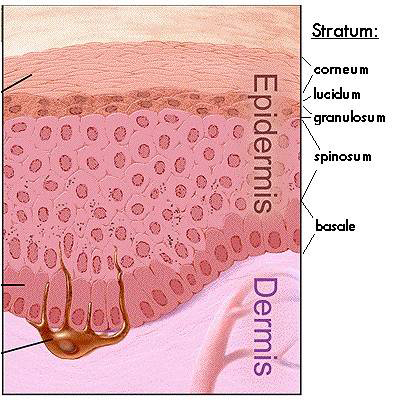 The epidermis itself is comprised of five layers, listed from the bottom up: the basal cell layer, the squamous cell layer, the stratum granulosum, the stratum lucidum, and the stratum corneum--stratum, of course, being Latin for "layer." The basal layer (stratum basale) is the innermost or deepest layer of the epidermis and contains small round cells called basal cells. This is where skin cells are first created by continually dividing, thus producing new cells, and the new cells constantly push older ones up toward the surface of the skin, where they are eventually shed. The basal cell layer is also known as the stratum germinativum due to the fact that it is constantly germinating (producing) new cells. In addition to the basal cells, the epidermis contains melanocytes. These cells produce a pigment known as melanin, which gives our skin its color. Melanin also protects the deeper layers of the skin from the harmful effects of the sun. Sun exposure causes melanocytes to increase production of melanin and darken the skin in order to protect the skin from damaging ultraviolet rays. This is what gives us a suntan. It is not a coincidence that, as a rule, people tend to get lighter the further from the equator you go. Patches of melanin in the skin also cause birthmarks, freckles, and certain types of age spots. (Lipofuscin accounts for the rest.) Melanomaas its name would indicate develops when melanocytes become malignant. Basal cell carcinoma, which is far more common, develops, as its name would indicate, in the basal cells. Incidentally, there are approximately 1,000 to 2,000 melanocytes per square millimeter of skin. It may sound like a lot, but given the size of the cells, this is actually a very small number. To give you some perspective, melanocytes represent only 5% to 10% of the cells in just the basal layer of epidermis. And remember, the entire epidermis--all five layers--is only as thick as a piece of tissue paper. And in truth, we're not even talking about the melanocytes themselves, but rather, the pigment they produce. It is truly amazing how much pain, cruelty, and suffering have been inflicted on countless millions and how many wars have been waged over such an insignificant component of the body. The squamous cell layer is located immediately above the basal layer. It is also known as the stratum spinosum or "spiny layer" due to the fact that the cells are held together with spiny projections called desmosomes. Desmosomes can be thought of as sticky protein projections that link up from cell to cell, holding the cells together so that the skin can resist shearing and tearing. Within this layer are the basal cells that have been pushed upward from the basal layer. However, these maturing cells are now called squamous cells, or keratinocytes. Keratinocytes produce keratin, a tough, protective protein that makes up the majority of the structure of the skin, hair, and nails. The squamous layer, then, is the part of your skin that gives it its structure…that holds it together. It is also the thickest layer of the epidermis and is involved in the transfer of substances in and out of the body. The squamous cell layer actually contains even more Langerhans cells than the basal layer. As we mentioned a moment ago, these are part of your skin's immune system. They work by attaching themselves to antigens that invade damaged skin and then alert the immune system to the presence of the antigen. The stratum granulosum is a thin layer of cells located just above the squamous cell layer. It is formed by keratinocytes migrating from the underlying stratum spinosum. These cells now contain visible keratohyalin granules, which are filled with proteins that promote hydration and the crosslinking of keratin--thus the name of the layer. This is the last layer of the epidermis that contains viable cells. At the transition between the stratum granulosum and the stratum corneum sits the stratum lucidum. It is composed of three to five layers of not-quite-dead but no-longer-viable, flattened keratinocytes. The keratinocytes of the stratum lucidum do not feature distinct boundaries and are filled with eleidin, an intermediate form of keratin. In the process of dying, these cells produce lamellar bodies, which are secretory organelles that contain fats and proteins.1 This results in the formation of the hydrophobic (water repellant) lipid envelope, which is responsible for the skin's barrier properties. It is in this layer that the granular cells lose their nuclei and organelles causing them to become clear…and non-viable. And in fact, stratum lucidum literally translates from the original Latin as the "clear layer." It is so thin and translucent that it is difficult to see, even with a microscope, except in areas of thick skin found on the palms of the hands and the soles of the feet. The stratum corneum is the outermost layer of the epidermis, and is made up of 10 to 30 thin layers of continually shedding, dead skin cells pushed up from the lower layers. In this layer, the one-time squamous cells (or keratinocytes) are now called corneocytes. The stratum corneum is also known as the "horny layer" because its cells are toughened like an animal's horn. As the outermost cells age and wear down, they are replaced by new layers of strong, long-wearing cells. The stratum corneum is sloughed off continually as new cells take its place, but this shedding process slows down with age. Complete cell turnover takes place every 28 to 30 days in young adults, while the same process takes 45 to 50 days in elderly adults. At one time, the stratum corneum was thought to be biologically inert, like a carnauba wax finish on a high end automobile paint job. Over the last quarter of a century, though, scientists have discovered that the stratum corneum is biologically and chemically very active and very complex. The stratum corneum contains about 12-16 layers of corneocytes, each about 1millionth of a meter in thickness. The structure of this layer has been described as "brick and mortar," with the corneocytes serving as bricks. No longer living cells, corneocytes are now essentially protein complexes still containing the secretory organelles (lamellar bodies) that were formed during their transition phase. The protein in the corneocytes takes the form of tiny threads of keratin in an organized matrix. The keratin can hold large amounts of water between the fibers/threads, at least in younger skin. Over several days, as the corneocytes mature, enzymes degrade the outer envelope of the lamellar bodies releasing types of lipids called free fatty acids and ceramides. These free fatty acids and ceramides then fuse together in the stratum corneum to form a continuous layer of fats. Because there are two types of fats, this layer is referred to as a lamellar lipid bilayer. This lipid bilayer plays a major role in maintaining the barrier properties of the skin. It is the glue that holds this layer together--or the "mortar," if you will, in the brick and mortar model. But we are not done yet. Each corneocyte is surrounded by a protein shell called a cell envelope. The cell envelope is primarily composed of two proteins, loricrin and involucrin. These proteins connect with each other through a vast number of links “riveting” each corneocyte to its neighbors. The "rivets" that hold these links, and thus the corneocytes, together are the same specialized protein structures found in the stratum spinosum—desmosomes, or in this case corneodesmosomes. Corneodesmosomes are the major structure that must be degraded for the skin to shed in a process called desquamation. This brick, mortar, and rivet combination makes the cell envelope the most insoluble structure of the corneocyte. And then to make things even stronger, attached to the cell envelope is a layer of waxy ceramide lipids that repels water. Because the lamellar lipid bilayer also repels water, water molecules are held between the cell envelope lipids and the lipid bilayer. Because the lamellar lipid bilayer also repels water, water molecules are held between the cell envelope lipids and the lipid bilayer. This helps maintain the water balance in the stratum corneum by trapping water molecules instead of letting them absorb into the lower layers of the epidermis. Again, this works better in younger skin than older. The desquamation, or exfoliation, process of the stratum corneum is actually very complex and only parts of this process are fully understood. We do know that several enzymes degrade the corneodesmosomes in a specific pattern, but we don't know the exact nature of these enzymes or how they become activated to start the exfoliation process. We do know, though, that water and pH play a significant role in the activity of these enzymes. As you've probably gathered by now, hydration is a key component of healthy, youthful skin. So it shouldn't come as a surprise that the stratum corneum has yet another mechanism for regulating hydration. Natural moisturizing factor (NMF) is a collection of water-soluble compounds that are only found in the stratum corneum. These compounds make up approximately 20-30% of the dry weight of the corneocyte. NMF components absorb water from the atmosphere and combine it with their own water content allowing the outermost layers of the stratum corneum to stay hydrated despite exposure to the elements. Because NMF components are water soluble, they are easily leached from the cells with water contact - which is why repeated contact with water actually makes the skin drier. The lipid layer surrounding the corneocyte helps seal the corneocyte to prevent loss of NMF. Virtually all anatomy textbooks, when talking about the skin, stop with the stratum corneum. They are wrong--or at least incomplete. In the same way that the probiotics that live in your intestinal tract are not extraneous invaders, but rather an essential component of your intestinal health, so too are the bacteria that live on your skin an essential component of your skin's health--and your overall health for that matter. The skin flora, more properly referred to as the skin microbiome or skin microbiota, are the microorganisms which reside on your skin. Many of these are bacteria, of which there are around 1,000 species commonly found on human skin. The total number of bacteria living on the skin of an average human has been estimated at about 1 trillion. Most are found in the superficial layers of the epidermis and the upper parts of hair follicles. Yes, some of these bacteria are "potentially" harmful. Staph and E. coli, for example, are found on most people, but they are usually held in check by the other bacteria on your skin and never produce any symptoms. That said, most of the flora found on your skin are beneficial in that they prevent the bad guys from colonizing the skin surface, either by competing for nutrients, secreting chemicals against them, or stimulating the skin's immune system.2 These are what hold the Staph and E. coli that we mentioned a moment ago in check. This protection, however, can break down allowing the pathogens to cause skin diseases and even enter the bloodstream, thus creating life-threatening diseases. What causes this breakdown? If a person's immune system is suppressed. If proper hygiene with soap and water is not practiced, this gives pathogens a chance to take root and multiply. If a person overindulges in antibacterial soap, this encourages the breeding of super, drug-resistant pathogens. If the water you bathe with is chlorinated. Chlorine kills all the bacteria on your skin, including the good--thus creating an opening for opportunistic pathogens that may have more resistance to chlorine to colonize your skin with wild abandon. The bottom line is that your skin microbiome is an essential layer in the anatomy of your skin. You want to take care of it. The dermis is the middle layer of the skin and is located just below the five layers of the epidermis. It is actually made up of two sublayers: the papillary layer and the reticular layer. The dermis is the thickest of the three layers of the skin (1.5 to 4 mm thick). It makes up approximately 90 percent of the thickness of the skin. The main functions of the dermis are to regulate temperature and to supply the epidermis with nutrient-saturated blood. Much of the body's water supply is stored within the dermis. Again, hydration! This is one of the reasons that if you want your skin to retain a youthful appearance, you have to maintain proper hydration. The bottom line is that your skin will show signs of dehydration long before your blood or any of your internal organs do--in other words, long before your doctor tells you that you have a problem with dehydration. It is this lack of understanding of the early signs of dehydration that has led many doctors to believe that the alternative health community's obsession with drinking enough water is unwarranted. They are wrong…or rather, they are looking too deeply and missing the forest for the trees. In this case, the information they need to look for is only skin deep. And yes, it's possible for the skin to become too hydrated. This is called cutaneous edema, and it is not caused by drinking too much water. It is caused by water retention as the result of systemic conditions such as pregnancy in some women, kidney failure, heart failure, and even some diseases; or it can result from local conditions such as varicose veins, thrombophlebitis, insect bites, and dermatitis. Cutaneous edema is known as "pitting" edema if, after pressure is applied to a small area of the swelling, the indentation persists for some time after the release of the pressure. But again, this has nothing to do with drinking water. The Papillary Layer is the upper layer of the dermis and lies directly beneath the epidermis and connects to it via finger-like projections called papillae. It also contains a thin arrangement of collagen fibers. The papillary layer supplies nutrients to select layers of the epidermis and regulates temperature. Both of these functions are accomplished with a thin, extensive vascular system that operates similarly to other vascular systems in the body. When the capillaries constrict and expand, this controls the amount of blood that flows through the skin and determines if the skin loses body heat when it is hot or conserves body heat when it is cold. Incidentally, a double row of papillae in finger pads produces the ridged fingerprints on fingertips, as well as similar patterns on the palms of the hands and the soles of the feet. Fingerprints and footprints prevent the skin from tearing and help to grip objects. The papillary layer also contains Meissner's corpuscles, which are nerve ending receptors that respond to mechanical touch or pressure. They are responsible for the ability to feel light touch and can sense vibrations below 50Hz. They do not detect deep pressure or pain. As a side note, the number of Meissner corpuscles drops to one-quarter its original count between the ages of 12 and 50. The Reticular Layer is the lower layer of the dermis and sits directly under the papillary layer. It is thicker than the papillary layer and made of dense collagen fibers that are arranged parallel to the surface of the skin. It is not only thicker than the papillary, it is denser, and it strengthens the skin, providing structure and elasticity. It is, in fact, the primary location of the dermal elastic fibers (elastin). Elastic fibers are what give your skin the ability to return to its original shape after being stretched or deformed. Elastic fibers are capable of extension to approximately twice their resting length. In contrast to collagen bundles, elastin fibers are wavy, as well as branching. Elastin is notably absent from scarring processes such as scars, keloids, and dermatofibromas, thus accounting for their lack of flexibility. Surprisingly, there is little loss in either the number or function of elastic fibers as the result of aging.3 The loss of skin elasticity with aging is more likely the result of the significant loss in the thickness of the dermis, a loss of fibroblast cells, cell senescence (a decrease in the biosynthetic activity of the fibroblasts), and negative modifications of macromolecules in the extracellular matrix (the material that envelops all of the cells in the reticular layer). Fibroblasts, incidentally, are connective tissue cells that produce proteins such as collagen and elastin, as well as other macromolecules. The reticular layer also supports other components of the skin, such as hair follicles, sweat glands, and sebaceous glands. Apocrine glands are larger than eccrine glands and have a different mechanism of secretion. They are found only in the hairy areas of the body, notably the armpits and pubic region. These glands secrete an odorless, oily, opaque secretion that gains its characteristic odor upon bacterial decomposition sweat. This results in what we commonly call body odor. So what purpose do they serve, other than making us smell bad? In hoofed animals, apocrine glands act as the main thermoregulator, secreting watery sweat, but in humans, that function is covered by the eccrine glands. As it turns out, part of that milky secretion they produce is a cornucopia of pheromones that serve as territorial markers, warning signals, and sexual attractants. Also, being sensitive to adrenaline, in humans apocrine sweat glands are involved in emotional sweating induced by anxiety, stress, fear, sexual stimulation, and pain. Both apocrine and eccrine sweat glands secrete muscle cells which then locate between the gland cells and the underlying extracellular material. It is the contraction of these muscle cells that squeeze the gland and discharge the accumulated secretions. The secretory activities of the gland cells and the contractions of myoepithelial muscle cells are controlled by the autonomic nervous system and circulating hormones. Note: ear wax glands and mammary glands are considered to be modified sweat glands. Sebaceous, or oil, glands, are microscopic glands attached to hair follicles and can be found everywhere on the body except for the palms of the hands and the soles of the feet. These glands secrete a waxy oil known as sebum (from the Latin for "fat) that helps keep the skin smooth and supple. The oil also helps keep skin waterproof and protects against an overgrowth of bacteria and fungi on the skin. In humans oil glands are concentrated in the face and scalp. Sebum is made of triglyceride oils, wax, and squalene (an oily liquid related to cholesterol). Sebum is produced in specialized cells in the sweat glands and is released as these cells burst--a delivery method very different from that found in the endocrine and exocrine glands that we've previously looked at. Most anatomists consider them to be a subset of exocrine glands, but because of their unique delivery system, involving the disintegration of the entire cell, sebaceous glands are sometimes considered unique and are then called holocrine glands, from the Greek for "whole." Sebum keeps hair and skin supple. Sebum is odorless, but its bacterial breakdown can produce odors. Excess sebum is the reason some people have "oily" hair. Earwax, incidentally, is partly composed of sebum. Men secrete slightly more sebum than women. It's a natural oil and works to moisturize the skin and hair and keep them from drying out. In fact, sebum is fundamental for healthy hair and skin which is one reason why men tend to wrinkle less than women. It's also one of the reasons men tend to have more body hair and acne. And there's one other problem for men. Sebum tends to come loaded with dihydrotestosterone (DHT). For those who are genetically sensitive to DHT, that means hair loss. For those who are sensitive, then, a key step in managing the onset of hair loss is to keep sebum levels down. On the surface of the scalp this can be done with jojoba shampoos. Chemically, jojoba is very similar to sebum and will actually dissolve it--thus helping to wash away any excess accumulation on the scalp. Internally, this can be done with the help of herbal testosterone balancers. Nerve Endings. As we've already mentioned, the dermis layer contains pain and touch receptors that transmit sensations of pain, itch, pressure (heavy and light) and information regarding temperature to the brain for interpretation. If necessary, shivering (involuntary contraction and relaxation of muscles) is triggered to generate body heat. Collagen. We've already touched on collagen, but it's worth spending a little more time talking about it. Since both the collagen that holds the dermis together and the elastin that gives it its ability to stretch without losing shape are made in the fibroblast cells found in the dermis, it should not be a big surprise that the protein found in both is similar. Collagen is a tough, insoluble protein found throughout the body in the connective tissues that holds muscles and organs in place. In the skin, collagen supports the epidermis, lending it its durability. Unfortunately, unlike elastin which does not decline as we age, collagen levels in the skin do decline--thus contributing to the appearance of aging skin. And, finally, sitting below the dermis is the innermost layer of the skin, the subcutis, which consists of a network of fat and collagen cells. Although it contains some sensory receptors such as Pacinian (AKA lamellar) corpuscles that respond to gross pressure changes and vibration, it primarily functions as both an insulator, conserving the body's heat, and as a shock-absorber, protecting the inner organs from outside assaults. It also stores fat as an energy reserve for the body. Blood vessels, nerves, lymph vessels, and hair follicles also cross through this layer. The thickness of the subcutis layer varies throughout the body and from person to person. When you "pinch an inch or two…or three" on your skin, it's mostly the subcutis that you feel. In other words, the subcutis is a primary area for fat storage. In the next issue of the newsletter, we'll discuss the physiology of the skin…and more particularly, some of the diseases and problems commonly associated with the skin. In turn, we'll explore some natural alternatives for dealing with these problems. And we'll also cover the nature of aging in the skin and some of the things you can do to slow that down. As we've discussed, a key component of skin health is its water content--hydration. And as we've also discussed you can't put that water in from the outside. In fact, excessive exposure to water dries out the skin, not to mention wrecking havoc with the microbiome. You need to hydrate internally by drinking lots of water and consuming fewer diuretics such as coffee. Assist your microbiome by washing your skin (especially your hands) regularly with soap and water. And do not use antibacterial soap as it destroys your microbiome, which leaves you far more vulnerable to aggressive pathogens. You also might want to think about putting a chlorine filter on your showerhead so as not to totally destroy those trillion beneficial bacteria living on your skin. always great and informative articles . What would help prevent and alleviate excema? In your next report please include what would prevent and heal rosacea and skin tags. I read that chlorine only stays in water for 24-30 hours. If this is true, and I shower from water that is stored in my hot water heater, then how much chlorine is actually in the water that I shower with? I am thinking not enough to kill bacteria on my skin. What say you? Yes, chlorine will evaporate out of water to a certain degree--given exposure to air, but there is no exposure to air in your water tank. You get a full dose of chlorine in your morning shower. Also, the larger the volume of water, the lower the percentage of evaporation. The chlorine in a glass of water can evaporate in a couple of days, but think of a backyard swimming pool. The chlorine that you put in it stays strong for days before you have to refresh it. The water in your water tank is equivalent to many, many, many glasses of water. Even with air exposure—again, which it does not have--it would take quite awhile for the chlorine to evaporate off. Far longer than it sits in the tank. And so say all of us. Very imformative. What type of foods contribute to healful skin? What causes the skin to bleed just underneath as it ages? Very informative. I want to know, what to use effectively in case of psoriasis. In your next newsletter could you please address sun sensitivities. I live in an apartment and the water heater is turned up to a scalding temperature. It is very hard to regulate and I am having issues with the skin on my back that even the dermatologist cannot resolve. I am a 76 year old very healthy woman except for that ! Where does one purchase a chlorine filter for a showerhead. Jon, concerning the sebaceous glands and seborrheic dermatitis (scalp), does jojoba shampoo work as well for outbreaks and controlling it? I've tried diet, natural shampoos without perfumes or colors (Urtekram brand). These work to a degree but nothing has been 100%. I've also tried sebiprox shampoo which does work well but there are side effects like blurred vision and chemical smell all day. What are better alternatives?